Last post I wrote about my black linen jacket ease problem. It's been a week of "rescue this garment". Upsize a bridesmaid dress by 6" in the bust. I used fabric from the hem. Each inserted piece had a seam in the middle. Now it fits! The customer is happy! I still need to finish the hem and shorten the straps a little. A bride and her mom brought in a Hong Kong Cheongsam dress started by bride's sister. Sister has left town and the dress has a few problems besides finishing. This is a Folkwear pattern. It was sloppily sewn and made to fit with 2" seams. I disassembled the dress and recut the front piece, using the original front and making it a size smaller. The back will take new fabric. The neckline was cut too big and uneven. Bride is buying more fabric for delivery tomorrow. The front piece now has darts that are evenly spaced and bias trim on the top edge. The first trim is cut 1" wide, pressed with a fold, and applied with the fold on the seam line. 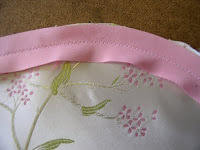 The trim is opened, sewn on the fold line, and folded again toward the edge of the fabric. The second bias strip is cut 2" wide, folded in half, and sewn with the edges even with trim #1. This sewing is 1/16" closer to the edge of the garment. 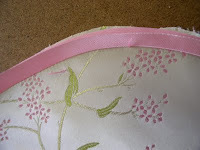 Seams are trimmed near the stitching and trim #2 is hand stitched to the back, covering all raw edges. No pictures today, but I have more trim to sew in the next day or so. Today I got to rescue a bridesmaid. She's 6 mo pregnant and lives elsewhere. Mom made her a dress to wear to a wedding tomorrow. The top of the dress is tooooo small. 6" too small. At least there was fabric left from the construction. Two hours later, the dress zips. It isn't perfect, but her sister c ould see where I had added the pieces. 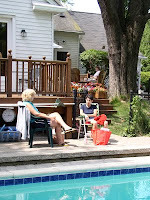 My knitting guild had a picnic on Sunday. Weather was iffy and attendance was low, but we had a good time. I could show pictures of people eating and stuff, but I won't. 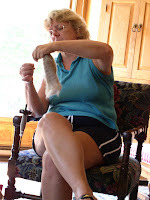 Nora was spinning lace weight cashmere. S he started indoors before lunch. The deck had some nice shade, but wasn't very warm this day. Work moved poolside. No One went swimming this day. It's a great location, a house and pool on about 5 acres, owned by one of our members. I worked on a stealth project for Christmas and got a lot done. This is a project that I work on every day off. Socks are my take along project for most occasions. I started knitting a pair for each birthday. I'm now a little behind, becuase of lots of July birthdays. There are no sock birthdays in August and I have one September pair done. Wish me luck and fast knitting.